The new 2017 Land Rover Discovery— the successor to the mighty LR4— is upon us, and I’m in Utah off-roading and on-roading (Is that a word? Anyway) the crap out of it for a few days. So tell me what you want to know, and I’ll do my darnedest to figure out some answers. The new Discovery is a major departure from the LR4, not only because of its much more conservative, round styling, but also because its aluminum body (and completely monocoque construction, versus the old car’s “Integrated Body Frame”) means it doesn’t weigh as much as a Nimitz-class carrier. So far, I’ve driven the 340 horsepower supercharged V6 gas version of the Discovery on twisty canyon roads in southern Utah—roads that are so perfect, even a leaf-sprung Defender would feel like a magic carpet. Still, handling seems good, though I’ll give it another day before I make any final judgements. I also got to do a bit of off-roading today (as you could probably have guessed from the image above), and I’ll do more tomorrow. A few months ago, when the Discovery debuted at the Paris Motor Show, I said that on paper, this thing should be an off-roading beast. By the end of tomorrow, I should have a good idea of how well those specs translate into reality. 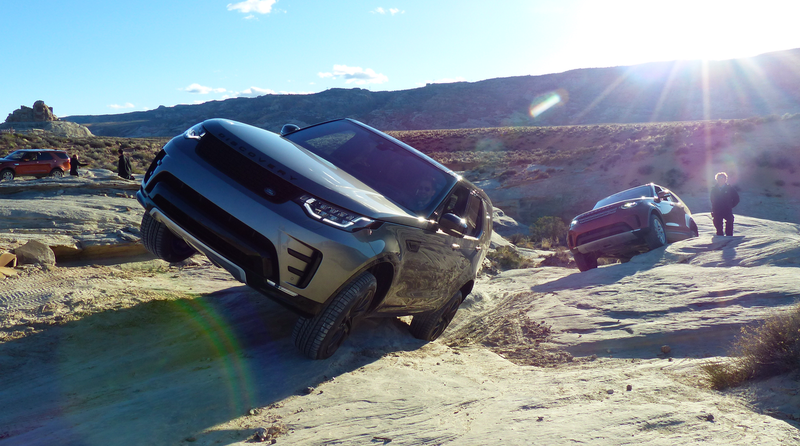 Clearly, I’m most interested in how well it does in the dirt and rocks, but what do you want to know about the 2017 Land Rover Discovery? The New Disco Is Ready For Suburbs Near You!